Vietnam attaches importance to developing relations with Palestine and is willing to share its experiences regarding national construction and defense, President Nguyen Minh Triet has said. State President Triet delivered the statement during his talks with Palestinian President Mahmoud Abbas, following an official welcome ceremony held for the Palestinian leader in Hanoi on May 25. 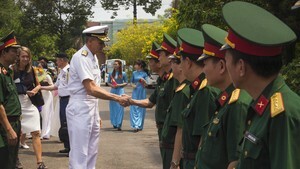 President Triet applauded President Abbas’s visit to Vietnam, describing it as evidence of the time-honored friendship between the two countries’ people. He expressed his delight at development in the bilateral relationship and confirmed Vietnam’s consistent position of backing the Palestinian people’s just struggle for basic national rights. The Vietnamese leader said he hoped that the Palestinian people would join efforts to consolidate national unity to bring their struggle to the final victory. 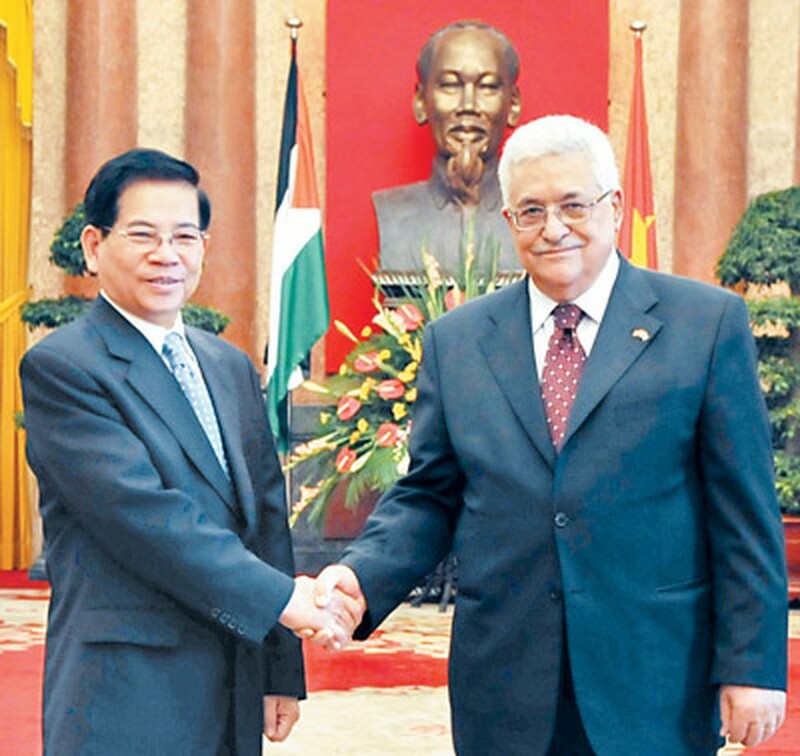 Abbas, who is also President of the Palestinian National Authority and Chairman of the Executive Committee of the Palestine Liberation Organization (PLO), spoke highly of the great achievements Vietnam has recorded in the process of renewal and national construction. Palestine wants to boost the traditional friendship and expand cooperation with Vietnam in many fields, especially in trade, agriculture, health care and education, he said. The two leaders agreed to request concerned ministries and agencies to soon take specific measures in a move to step up bilateral cooperation in areas both nations hold potentials, implement the signed agreements, and accelerate negotiations for the signing of deals in investment and finance. President Abbas took this occasion to invite President Triet to pay a visit to Palestine and call on Vietnamese companies to explore investment and business opportunities in his country. Following the talks, the two leaders witnessed the signing of a framework agreement on cooperation in the fields of economics, culture, education, science, technology, sports and tourism between the two governments. Other compacts included a memorandum of understanding on cooperation between the two Ministries for Foreign Affairs, a cooperation agreement between the two Ministries of Education and a cooperation agreement between the Vietnam News Agency and the Palestine News and Information Agency. Earlier, President Abbas laid a wreath in tribute to late President Ho Chi Minh at his mausoleum in Hanoi.